This chapter examines the network of Colombian sovereign securities settlements. With data from the settlement market infrastructure we study financial institutions' transactions from three different trading and registering networks that we combine into a multi-layer network. Examining this network of networks enables us to confirm that (i) studying isolated single-layer trading and registering networks yields a misleading perspective on the relations between and risks induced by participating financial institutions; (ii) a multi-layer approach produces a connective structure consistent with most real-world networks (e.g. sparse, inhomogeneous, and clustered); and (iii) the multi-layer network is a multiplex that preserves the main connective features of its constituent layers due to positively correlated multiplexity. The results highlight the importance of mapping and understanding how financial institutions relate to each other across multiple financial environments, and the value of financial market infrastructures as sources of data for working on multi-layer financial networks. Financial market infrastructures are considered the “plumbing” of financial systems (Bernanke, 2011). Financial market infrastructures responsible for settling transactions between financial institutions fulfill a pivotal position within that plumbing, thus they are of particular interest to disentangle and dissect this complex structure of financial systems by means of network analysis. Under this analytical framework, this chapter studies the local sovereign securities settlement infrastructure in order to attain a more detailed and actual illustration of how financial intuitions organize themselves in the corresponding legal, operational, and economic contexts. As transactions settled originate in different trading and registering platforms, a single network of settlements should necessarily aggregate networks from other financial market infrastructures. In this vein, the settlement network is a network of networks, which entails additional sources of complexity, critical for understanding financial markets. This is consistent with recent efforts to examine the consequences of considering financial systems as multi-layer networks, in which financial institutions interact across several environments or layers (e.g. markets, asset classes, trading and registering platforms, jurisdictions). The theoretical development of multi-layer networks (and its empirical validation) is still in scaffolding, and consequently most literature on multi-layer financial networks is still preliminary. Nevertheless, there is a consensus regarding the need to examine how the basic assumptions of real-world networks are altered in a context of multi-layer networks or networks of networks. Most examinations have focused on how real-world networks’ coupling affects their well-documented inhomogeneous connective architecture, in which connections being distributed in an extremely skewed fashion (presumably following a power-law distribution) contribute to their robustness; as most participants are weakly connected, most real-world networks, either biological or man-made, tend to be robust to the random failure of their constituents (see Newman, 2010, Barabási, 2003, Strogatz, 2003). In this sense, studying networks of financial networks allows to confirm if their individual well-documented robust-yet-fragile feature (Haldane, 2009) is also valid within a financial multi-layer network. Moreover, studying how single-layer financial networks’ couple allows understanding the rationale behind the main connective features of financial multi-layer networks. Consequently, in the light of the above view of the transactions in a settlement market infrastructure as a network of networks, this chapter has two main purposes: First, it examines how Colombian sovereign securities’ transactions that come from single-layer networks (corresponding to distinct trading and registering platforms) can be aggregated into a multiplex network of the sovereign securities settlement system. Second, it verifies whether or not viewing a financial system as a multiplex network is a superior view in that it preserves the main connective properties of its constituents, while revealing some additional layers of complexity. 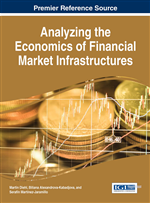 This chapter contributes to the financial literature by examining the connective structure of financial institutions’ interactions under different economic and operational environments, and by investigating how those interactions aggregate and result in the local sovereign securities’ market. The examination of how financial networks’ connective structure changes as a consequence of the overlap of financial institutions across different economic domains is significant for financial authorities pursuing or contributing to financial stability. Moreover, in the context of the networks of networks literature, this chapter contributes to the study of financial market infrastructures by revealing that they critically depend on their interaction with other financial market infrastructures. In our case, the local sovereign securities settlement market infrastructure depends on its interaction with trading and registering platforms, but other types of interactions (i.e. with other settlement and clearing infrastructures) are also likely.